Etna (Italy). INGV-CT reported that during the first few days of December gas emissions from a large pit crater on the lower E flank of Etna’s Southeast Crater cone nearly ceased. On 22 December at 0446 a strong explosion occurred at the W vent of the Bocca Nuova (BN-1). This event generated an ash plume a few metres high which then drifted NE, causing light ashfall in areas as far as the town of Linguaglossa (17 km NE). On 23 December bluish gas rose from a vent at the base of the W wall of the pit, at the base of the Southeast Crater cone. Bright incandescence was intermittently visible on video footage. Inclement weather prevented clear observations that day and during the next few days. On 29 December extremely small amounts of incandescent material emitted from the pit crater were observed using visible and thermal cameras. The brief emissions (2-6 second intervals) were jets of mainly hot gas that barely rose above the rim of the pit crater. Inclement weather again prevented observations of the crater during 30-31 December. During the late afternoon on 2 January strong incandescence at the pit crater evolved into vigorous Strombolian activity. Frequent Strombolian explosions (1-3 per minute) ejected coarse-grained incandescent material a few tens of metres above the rim of the pit. On a few occasions, incandescent bombs fell outside the pit’s rim, mainly to the S and E. The activity continued into the early morning then decreased markedly. Negligible quantities of volcanic ash were produced. Kizimen (Russia). KVERT reported that a thermal anomaly over Kizimen’s lava dome was observed in satellite imagery during 29 December-1 January and that an explosive eruption that began on 13 December continued. On 31 December seismicity increased and volcanic tremor was detected. Explosions occurred sporadically for a period of about 20 minutes. Ash plumes detected in satellite imagery rose to an altitude of 8 km (26,200 ft) a.s.l. and drifted SW. Ashfall at least 1 mm thick occurred in multiple areas 225-275 km SSW, including Petropavlovsk-Kamchatsky, Yelizovo, Paratunka, and Nalychevo. On 1 January the Aviation Colour Code was raised to Red. Ash plumes at an altitude of 4 km (13,100 ft) a.s.l. drifted 480-500 km SW; ash continued to accumulate in some areas. Seismic data indicated increased activity on 3 January. Explosions continued, and ash plumes drifted more than 200 km SE. A large and bright thermal anomaly was observed in satellite imagery. Based on analysis of satellite imagery, the Tokyo VAAC reported that possible eruptions during 2-4 January produced plumes that rose to an altitude of 3-4.6 km (10,000-15,000 ft) a.s.l. and drifted S, E, and NE. Subsequent images on those same days showed ash emissions continuing, then dissipating. Manam (Papua New Guinea). RVO reported that on 25 December a new episode of eruptive activity from Manam’s South Crater began and was characterized during 25-29 December by rising ash plumes and ejections of incandescent lava fragments. Although most of the material fell back into the crater, some was deposited around the summit area, and some larger fragments were deposited in the SW and SE valleys. The Main Crater produced white plumes occasionally laden with ash. Incandescence was visible on some nights. On 30 December activity from South Crater increased and was reported by observers in Bogia, 20 km SSW, on the mainland. A dense ash plume rose 3 km above the summit crater and drifted NW. An observer at Tabele on the SW flank confirmed the eruption and also reported that three pyroclastic flows descended the SE valley, stopping by a few to several hundred metres from the coastline. The first and largest pyroclastic flow devastated a broad unpopulated area between Warisi and Dugulava villages. Ash plumes drifted NW and caused light ashfall in Tabele. RVO recommended an increase in the Alert Level to Stage 3. Later that day, ash emissions and incandescent fragment ejections diminished. On 31 December grey ash plumes rose 200-300 m above the South Crater and also above the Main Crater. Low booming sounds were noted and incandescence from the crater was observed at night. During 1-4 January eruptive activity continued from South Crater and grey-to-black ash plumes rose above the summit crater. Incandescence emanated from the crater. During 3-4 January incandescent fragments were ejected onto the flanks and rolled down the SE valley. White vapour rose from the Main Crater. Stromboli (Italy). INGV-CT reported that on 19 December a major explosion from a vent in the southern part of Stromboli’s crater terrace occurred at 0956, coincident with explosive sequence consisting of three discrete seismic events. During the last few days of December the ‘S1’ vent produced frequent explosions of greater intensity than those of the preceding days. Jets rose 200 m above the crater terrace. On 27 December, the frequency of the explosions rose to 11-14 per hour. The ‘S1’ vent is immediately next to the ‘S’ vent, the source of the 19 December explosion. Bezymianny (Russia). KVERT reported that during 24-30 December seismicity did not exceed background levels. The temperature of thermal anomalies observed in satellite imagery during 23-24 and 27-28 December gradually increased. Gas-and-steam emissions were seen on 27 and 28 December; clouds prevented observations on the other days. The Aviation Colour Code level remained at Yellow. Bulusan (Philippines). Based on notices from the Manila airport (RPLL), the Tokyo VAAC reported that on 29 and 30 December ash from Bulusan was observed. PHIVOLCS noted that inclement weather prevented views of the summit area during 29-31 December. 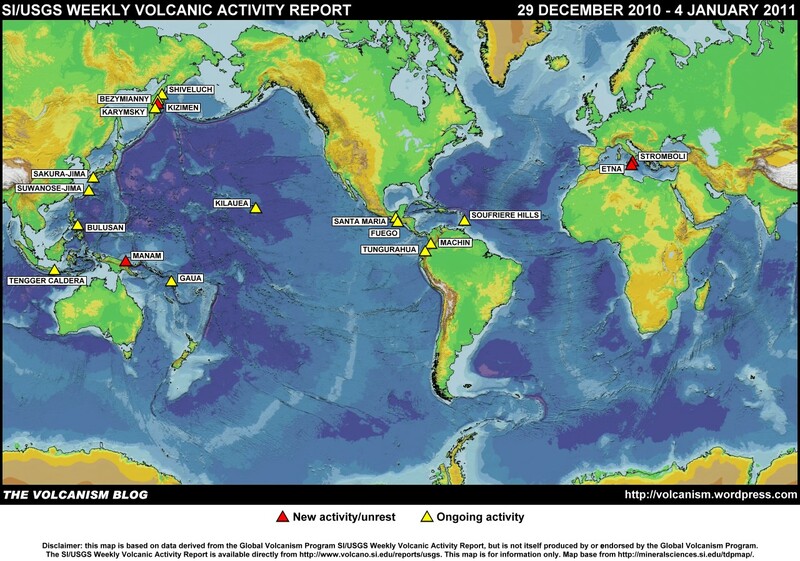 Eight volcano-tectonic earthquakes were detected by the seismic network during 30-31 December. Fuego (Guatemala). INSIVUMEH reported that during 29-30 December explosions from Fuego, almost constant at times, produced dense ash plumes that rose 600-800 m above the crater and drifted 8 km W and SW. Avalanches occurred on the flanks. The Washington VAAC reported that several small emissions observed in satellite imagery drifted W on 1 January. INSIVUMEH noted that during 3-4 January explosions generated ash plumes that rose 800-1,000 m above the crater and fanned out towards the S and SW. The plumes drifted almost 15 km and caused ashfall in areas downwind, including Panimaché (6 km SW), Morelia (7 km SW), and Santa Sofia (12 km SW). Incandescence from the crater was observed at night. Gaua (Vanuatu). On 21 December, the Vanuatu Geohazards Observatory reported that volcanic activity from Gaua had been low since September. Recent observations indicated that the near-vent vegetation and vegetation exposed to trade winds on the W side of the island was again growing. Seismic data showed a decreasing number of events. The Alert Level was lowered to 1 (on a scale of 0-4). Karymsky (Russia). KVERT reported that seismic activity at Karymsky was above background levels during 23-26 December and did not exceed background levels during 27-30 December. Seismic data suggested that possible ash plumes rose to an altitude of 4.3 km (14,100 ft) a.s.l. Thermal anomalies were detected in satellite imagery during 23-24 December; cloud cover prevented views on the other days. The Aviation Colour Code level remained at Orange. Based on a Yelizovo Airport (UHPP) notification, the Tokyo VAAC reported that on 31 December an ash plume rose to an altitude of 3 km (10,000 ft) a.s.l. and drifted E.
Kilauea (Hawaii, USA). During 29 December-4 January, HVO reported that activity at Kilauea continued from the summit caldera and the east rift zone. At the summit caldera, the level of the lava-pool surface in the deep pit within Halema’uma’u crater circulated and remained mostly stable at approximately 120 m below the crater floor, periodically rising several meters higher. Nighttime incandescence was visible from the Jaggar Museum on the NW caldera rim. A plume from the vent that drifted mainly SW deposited ash and fresh spatter nearby. At the east rift zone, lava that broke out of the Quarry tube onto the surface, at a saddle between two rootless shields at around the 610 m elevation, continued to advance in two branches. The lava flow at the lowest elevation advanced E beyond Kalapana by 3 January. Incandescence from a small spatter cone on the north-central part of Pu’u ‘O’o crater floor continued. Lava from that cone flowed SE, NE, and W. Lava from a second spatter cone, located on the NW edge of the crater, was active on the crater floor. Weak incandescence was also visible from a small, fume-producing vent in the E wall of the crater, and from other various areas on the crater floor. Machín (Colombia). According to INGEOMINAS, Observatory Vulcanológico and Sismológico de Manizales reported a period of increased seismicity from Cerro Machín on 31 December. A total of 346 volcano-tectonic events no stronger than M 2.1 were located S and SW of the main lava dome. On 1 January seismicity again increased, and at the time of the report, 367 events had been detected. The low-magnitude events were located S and SW of the main dome at depths between 2.5 and 4.5 km. The largest event, M 2.3, was located S of the dome at a depth of about 3.3 km and felt by residents near the volcano and in the municipality of Cajamarca, 14 km WSW. The Alert level remained at III (Yellow; ‘changes in the behavior of volcanic activity’). Sakura-jima (Japan). Based on information from JMA, the Tokyo VAAC reported that on 2 January a plume from Sakura-jima rose to an altitude of 1.8 km (6,000 ft) a.s.l. An explosion was noted the next day. An explosion on 5 January produced a plume that rose to an altitude of 1.2 km (4,000 ft) a.s.l. and drifted E.
Santa María (Guatemala). INSIVUMEH reported that during 29-30 December a few explosions from Santa María’s Santiaguito lava dome complex produced ash plumes that rose 300-600 m above Caliente dome and drifted S and SE. Ashfall was reported in local villages downwind. The Washington VAAC reported that several small emissions observed in satellite imagery drifted W on 1 January. During 3-4 January, INSIVUMEH reported that explosions produced ash plumes that rose 700 m above the complex and drifted SW. Avalanches descended the W part of the dome. Shiveluch (Russia). KVERT reported that moderate seismic activity from Shiveluch was detected during 24-30 December. Ash explosions on 24 December produced ash plumes that rose to altitudes as high as 4.5 km (14,800 ft) a.s.l. A bright thermal anomaly over the volcano was observed in satellite imagery during 24 and 27-28 December. Moderate gas-and-steam activity was visually observed on 24 and 28 December. The Aviation Colour Code level remained at Orange. Soufrière Hills (Montserrat). MVO reported that during 24-31 December activity from the Soufrière Hills lava dome was at a low level. Rockfalls or small pyroclastic flows detected by the seismic network occurred in the 11 February collapse scar on the N side of the volcano. Clouds prevented clear views of the lava dome. Lahars associated with heavy rains descended multiple drainages on 30 December. The Hazard Level remained at 3. Suwanose-jima (Japan). Based on information from JMA, the Tokyo VAAC reported an explosion from Suwanose-jima on 29 December. Details of a possible resulting plume were not reported. Tengger Caldera (Indonesia). Based on analyses of satellite imagery, the Darwin VAAC reported that on 30 December an ash plume from Tengger Caldera’s Bromo cone rose to an altitude of 4.3 km (14,000 ft) a.s.l. and drifted about 95 km E.
Tungurahua (Ecuador). Although storm clouds occasionally prevented observations of the summit area, IG reported that steam plumes were observed almost daily during 29 December-4 January. Incandescence from the crater was occasionally observed at night. On 30 December a steam-and ash plume rose 500 m above the crater and drifted W. On 2 January a small explosion produced an ash plume that also rose 500 m above the crater and drifted W.
The foregoing is a summary of the Smithsonian Institution/United States Geological Survey Weekly Volcanic Activity Report covering 29 December 2010 – 4 January 2011. It is provided for information only, and is based on but not a substitute for the full report, which comes with its own criteria and disclaimers. The map base is derived from the Smithsonian Institution/USGS/US Naval Research Laboratory This Dynamic Planet website. Volcanic activity increases around the globe. It is clear. It would be prudent research to see the scale graph of such activity.